To request a CHOP-In-A-Box Toolkit for your school or community organization, please fill out and return this request form. 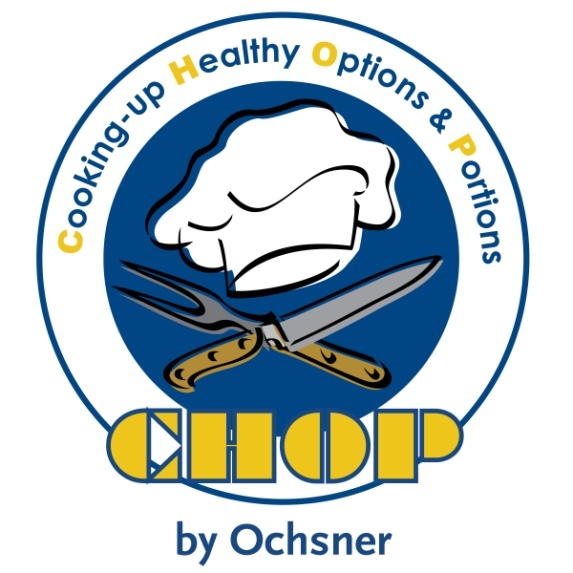 Beginning in January 2013, the CHOP (Cooking-up Healthy Options and Portions) initially started as an afterschool program that was implemented in two Jefferson Parish middle schools by Ochsner Health System as part of its “Change the Kids, Change the Future” program and through a grant from the Humana Foundation. The CHOP program’s partners and supporters include The LSU AgCenter, The Besh Foundation (Chef Alon Shaya), and the Jefferson Parish Public School System. CHOP was inspired by the West Virginia State University “FASTRAC” program. Students who participated not only learned valuable cooking skills, but they were able to take part in field trips to the Grow Dat Youth Farm and Rouses Supermarket that allowed them to see where their food comes from and how to shop for a healthy pantry. Ochsner’s Community Outreach staff revised and created recipes that show students they can still eat their favorite foods and be healthy at the same time, just by making a few small changes. Our goal is for students to translate their nutrition knowledge gained in the Smart Choices program into tangible skills to make healthy eating a habit, to prepare healthy meals and feel more confident in the kitchen. The CHOP program received a fair amount of positive publicity in the school community, business community, and community-at-large. Since Ochsner staff no longer teaches CHOP as an afterschool program, we have developed the next step of CHOP that we call, CHOP-In-A-Box. Through community partner discussions, idea-sharing and national nutrition program best-practice research, we developed a mechanism to condense CHOP into a deliverable, easily replicable kit. Quite literally, CHOP-In-A-Box translates to all supplies and tools necessary for any organization to teach and facilitate the CHOP program is provided in a one large box. The CHOP staff offers training for representatives from each organization that will be utilizing the CHOP-in-a-Box kits. CHOP Staff also attends the first meeting of the class to disseminate pre-tests for measuring base-level knowledge and behaviors and help with the first class. CHOP staff then attends the last meeting of the class to disseminate post tests for program satisfaction, and changes in knowledge and behaviors to measure to impact of the intervention. For more information about the CHOP-In-a-Box Toolkits, please contact Erin Arceneaux at EArceneaux@ochsner.org or 504-842-5919. CHOP has held its after-school programs at J.D. Meisler Middle and John Quincy Adams Middle Schools in Metairie, Theodore Roosevelt Middle School in Kenner, and Allen Ellender School in Marrero with help from ProStart students at Grace King High School, Bonnabel High School and John Ehret High School. 17.69% more students reported reading the Nutrition Facts Label on the foods that they eat. 5.01% more students reported drinking 4 or more glasses of water per day. 5.87% more students reported cooking meals at home at 4 or more times a week. 16.35% more students reported drinking skim, low-fat, or reduced fat rather than whole milk. 23.73% more students correctly identified Calcium as the mineral found in dairy products. 19.55% more students correctly identified a 1/2 cup of ice cream being the same size as a 1/2 baseball. 26.52% more students correctly identified that there are 8 ounces in 1 cup. 5.57% more students correctly identified the importance of eating protein. 34.48% more students correctly identified a calorie as the amount of energy we get from food. 22.01% more students correctly identified 20 seconds as the correct amount of time to wash hands. 7.81% more students correctly identified that Chicken and Eggs can cause bacterial illness if not cooked completely. 18.46% more students felt confident/very confident reading a recipe. 14.68% more students felt confident/very confident using knives safely. 16.09% more students felt confident/very confident making healthy food choices. 17.95% more students felt confident/very confident preparing and cooking healthy, great tasting meal.